LFG, LFT, etc? If you're new to Challengermode and are Looking For a Team or want to create a team but don't have teammates, here's how to get started! 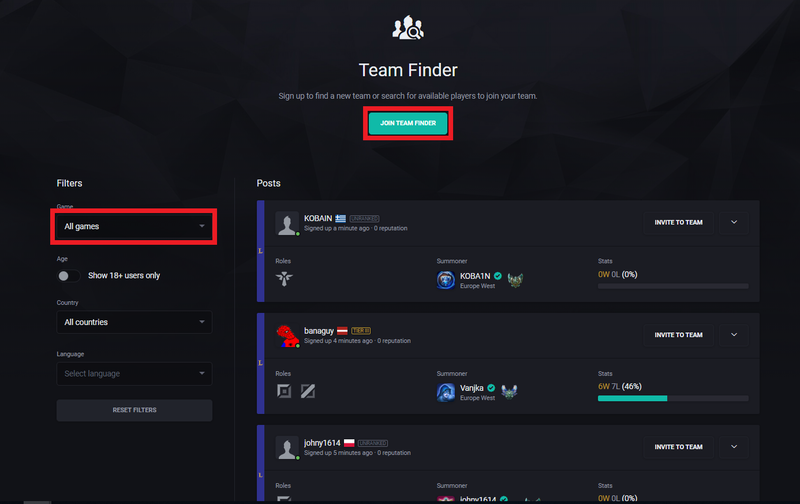 You can find the Team Finder in the left sidebar navigation. To see only posts for a specific game region or game (LoL EUW or CS:GO EU), use the filter function in the top left as indicated in the picture. Tip: Every 30 minutes you are allowed to "bump" your post putting you back at the top so that your post remains visible. Please note that when you are in the Team Finder, you can't remove any connected game account. To increase your chances of finding a team, make sure to write a good introduction and explain what it is you are looking for! "Hey! Platinum support main that rocks the Rift with Karma and Morgana. Looking for a team to take part in the Sunday Brawl tournament. Hope to form a long term team of players and play regularly in the weekly tournaments. Can chat in English but don't mind playing with people from other countries. PM or friend me!" Tip: People often use the abbreviations LFG or LFT, meaning "looking for team" or "looking for group".